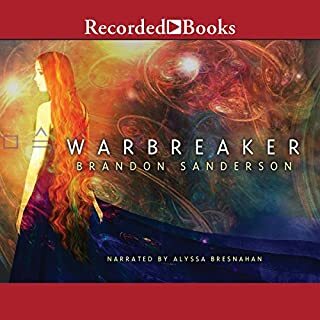 Warbreaker is the story of two sisters who happen to be princesses, the God King one of them has to marry, the lesser god who doesn't like his job, and the immortal who's still trying to undo the mistakes he made hundreds of years ago. Their world is one in which those who die in glory return as gods to live confined to a pantheon in Hallandren's capital city and where a power known as BioChromatic magic is based on an essence known as breath that can be collected only one unit at a time. Ten years ago, Calamity came. It was a burst in the sky that gave ordinary men and women extraordinary powers. The awed public started calling them Epics. But Epics are no friend of man. With incredible gifts came the desire to rule. And to rule man you must crush his will. Nobody fights the Epics...nobody but the Reckoners. A shadowy group of ordinary humans, they spend their lives studying Epics, finding their weaknesses, and then assassinating them. And David wants in. He wants Steelheart - the Epic who is said to be invincible. The Epic who killed David's father. When Shai is caught replacing the Moon Scepter with her nearly flawless forgery, she must bargain for her life. An assassin has left the Emperor Ashravan without consciousness, a circumstance concealed only by the death of his wife. If the emperor does not emerge after his hundred-day mourning period, the rule of the Heritage Faction will be forfeit and the empire will fall into chaos. Darrow is a Red, a member of the lowest caste in the color-coded society of the future. Like his fellow Reds, he works all day, believing that he and his people are making the surface of Mars livable for future generations. Yet he spends his life willingly, knowing that his blood and sweat will one day result in a better world for his children. But Darrow and his kind have been betrayed. Soon he discovers that humanity reached the surface generations ago. Vast cities and sprawling parks spread across the planet. According to mythology, mankind used to live in 'The Tranquiline Halls': heaven. But then the Voidbringers assaulted and captured heaven, casting out God and men. Men took root on Roshar, the world of storms, but the Voidbringers followed. The Almighty gave men powerful suits of armor and mystical weapons, the Shardblades. Led by 10 angelic Heralds and 10 orders of knights known as Radiants, mankind finally won (or so the legends say). Today the only remnants of those supposed battles are the Shardblades, the possession of which makes a man nearly invincible on the battlefield. The entire world is at war with itself - and has been for centuries since the Radiants turned against mankind. Kings strive to win more Shardblades, each secretly wishing to be the one who will finally unite all of mankind under a single throne. On a world scoured down to the rock by terrifying hurricanes, a young spearman is forced into the army of a Shardbearer, led to war against an enemy he doesn't understand and doesn't really want to fight. I have listened to over 100 Audiobooks, and this is the first time I really felt the need to write a review. I picked up a Brandon Sanderson book about two years ago, and was immediately impressed by his writing style. Too many fantasy writers forget how important it is that their worlds should also have rules and limits and plausible (if fantastic) magic. Every brilliant writer is an artist on his own, and should not be compared to another. Brandon Sanderson completed the Wheel of Time series, and I hope that he wouldn’t therefor mind being compared to Robert Jordan. An amazing story and a satisfying end, although I feel the itch of the addicted for the next book. 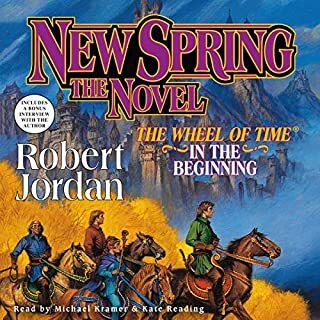 The brilliant narration by Michael Kramer and Kate Reading (the narrators for the Wheel of Time) takes you right into the world and leave you hungry for more. I give this book my highest recommendation and my only wish is that I can have a selective memory loss so that I can enjoy this one again. This book consumed my life for 3 weeks. Not a second of it was wasted. All of the characters are interesting and real. Even the bit players stuck with me - Ishic the Fisherman in particular. I really hope that Sanderson will expand on some of those in the next books - I'm optimistic, from all reports he'll have plenty of pages to fill :). I keep trying to imagine what will happen when all of the characters eventually meet (for instance, I'm certain that Rock will fall head-over-heels for Shalan). The glimpses you get of the 'magic' systems are intriguing, and I kept catching myself trying to put the pieces of it together when I really should have been doing other things (sleeping, for instance). The environment is unique, the plants and animals are a mixture of the familiar and strange and hint at events that must have happened in the world's past ... and even as I write this, I'm putting more pieces together :) I think I may have to listen to it for a 5th time. I would recommend listening to the whole book at least twice. Listening over it again with hindsight/foreknowledge of where the story is going lets you see events in a very different way, and the simple length means that even the most careful listener will miss some gems. I'm considering buying the hardcopy as well. The book is a true epic. Kate reading however with her weird end of sentence inflections ruins most of her parts. Her narrative is so irritating i found myself wincing everytime her part would come up. Kramer on the other hand is steady and stoic as expected. Ive been meaning to hear the wheel of time series but seeing its also kate reading, I think I'll give the audio books a pass. If you could sum up The Way of Kings in three words, what would they be? Getting towards the end, I found every opportunity to listen. This was very new to me. I thought I was going to be bogged down with slow periods in a long drawn out novel. I was very wrong. Splendid. Wow! Brilliant! One doesn't realise Brendan Sanderson's genius until you reach the end and can encompass the entire book. To write 40 hours of material with focus and and keeping the dialogues sharp and inventive is a unique talent. This book had a great variety of characters. Some "critic" reviews on other sites have complained about characters lacking depth. But, I found all the characters were well rounded and had a variety of facets to their personality. I would highly recommend listening to this book. I've been looking for a good epic fantasy world since I've finished Sword of Truth and got as far as you can with Wheel of Time, and if this book is anything to go buy The Stormlight Archive is going to be an amazing Epic fantasy series. 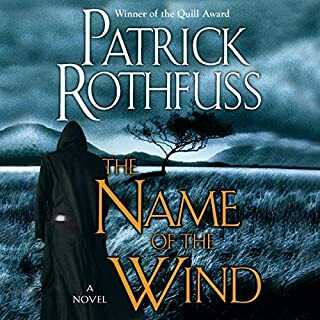 It might just be because this book has the same narrators as the Wheel of Time but the writing style is very similar to Robert Jordan, this might be why he was asked to finish off the WoT series after Jordan's death. The writing is great, the narration is great and the action scenes flow nicely enabling me to really visualise the story in my mind. Love it, five stars isn't enough. My heavens. This book creeps forward at a dizzyingly slow pace. He writes well and there has been great thought and care put into creating a world that is detailed and colorful. But oh my god, all the endless back and forth, uuurgh. Just kept wanting it to go. Anywhere. Now. Like riding a donkey after robbing a bank. What was one of the most memorable moments of The Way of Kings? Which character – as performed by Michael Kramer and Kate Reading – was your favorite? I won't spend time on a summarry as the publisher has that well covered. I have 105 Epic Fantasy titles in my audio library and I generally listen when out with the dogs or home alone, as it is a fairly anti-social activity. This is the first book I have listened to where I have found myself sneaking away to create 'listening space'. My interest didn't flag from beginning to end. 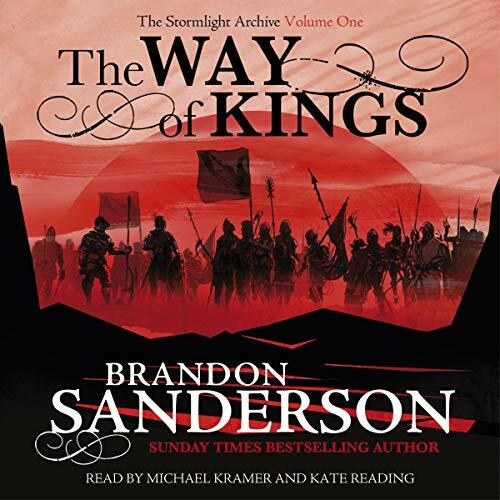 The narration by Michael Kramer and Kate Reading is as expert as you would expect, the characters are engaging and both the world and the plot which Brandon has created are riveting. A real five star listen! Brandon Sanderson has achieved something marvelous here. From the very opening scenes it is crystal clear that you are reading an author who has developed a fantasy world of incredible depth and detail. In these early action scenes he demonstrates a refreshingly ingenious form of combat magic, depth of character and hints at the world beyond. As the book unfolds the sheer scale of his imagination is revealed as the history, geography, flora, fauna, religion and mythology of his creation is revealed. This is done gradually without huge long paragraphs of description to bog things down. The characters too are thoroughly detailed and explored through conversation, flashbacks to previous times and even their dreams. There are no one-dimensional heroes or villains here, nothing in that sense is spoon fed as the characters have a constant struggle to find their right path. When reading this book time and again you will imagine you know where something is heading and be pulled up short. Sanderson is a very patient author and doesn’t take the easy plot route often. Of course with a book of this length the narration is important, forty-six hours of monotone would make this hard going and the idea of splitting the narration is a very sound one. Michael Kramer is excellent, he rumbles through the book adding real gravitas and atmosphere to Sanderson’s often grim world and its inhabitants. Kate Reading is eloquent and very precise but clearly not everyone’s cup of tea. I’m afraid she’s not mine, her intonation is too often lacking the correct inflection making her sound like an automaton at times. She does read much less of the book than her counterpart but I still think the audio sample should have included some of her reading to help prospective purchasers make an informed decision. All told this is a book that demands respect, it does take an investment from you to get through it but the rewards are incredibly rich. I was hooked in from the brilliant opening scenes which included some very innovative ideas. Sanderson is a genuine giant in the fantasy genre and those wanting depth, detail and new ideas coupled with a gripping story will definitely want to head this way. The last few hours of the story are as good as anything I have read. 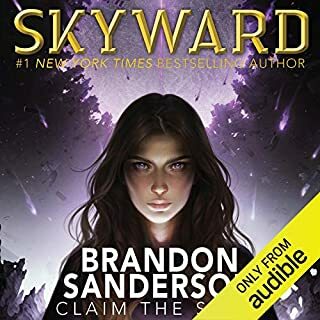 It would have been easy to dismiss this audio book after three or four hour due to the assault on my memory with the bewildering number of characters and an alien world introduced in a short amount of time, but persevere and it does not disappoint. The main characters grow depth as their history builds with recollections from the past enhancing this. The seemingly separate strand converge brilliantly leading to a satisfying finale. I appreciate the use of two narrators for the male and female roles, but if there is one slight criticism it is that they were not prepped on the pronunciation of the main characters names, this doing it differently in some cases. One of the best reads (or listens) I have ever had! Easily a five star rating - indeed it's making me question my other 5 star awards, as this is far superior to those. It's label of "epic fantasy" is more than justified. It's a unique story, in a unique landscape. Not so fantastical as to be ridiculous, but really well thought through, and everything gels together to make a world that is almost tangible. The plot is anything but predictable, nor are the characters. Many happy hours walking listening to this - and many "sneak away to keep listening" moments too! A really good listen (and the narrators are good - I think the dislike of Ms Reading must be a personal thing for some listeners - apart from pronouncing one of the characters names in a completely different way to the other narrator, I thought she was fine.). Highly recommended. I read with dismay that book 2 is only scheduled to be out in 2012 - gutted at the long wait! And a final thought.... it's a 7 part download of between 5& 7 hours each - pence per hour of listening, you'd be hard pressed to find better value thant this! What other book might you compare The Way of Kings to, and why? Kate Reading ruins this audio book. Its like listening to a computer read out the book witch each word being emphasized making none of it flow. Although Michael Kramer has been amazing throughout the book. 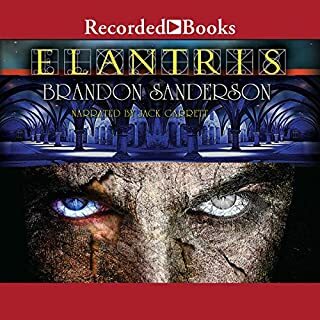 Yet another corker from Brandon Sanderson. This enormous audiobook kept me gripped from start to finish, and I am eagerly awaiting the sequel. Great story, I love the imagery. Michael Kramer works really well as the narrator, but I struggled with Kate Reading. she always sounds frantic and stresses sentences that don't need it. It adds unneeded tension and drama to scenes I envisage as being quite calm. It just pulls you out of an otherwise fantastic story. Was enthralled by this book, I work on a farm and for the 2 weeks planting cabbages, it made an otherwise sole destroying job tolerably, if i didn't have this to listen to i think i might have lost my mined, every part of this book kept my asking questions and wanting to hear more. just wish audible would bring part two out i really want to know what happens and being a slow stuttering reader id loose the story over such a large book. but defiantly for anyone who is looking for a good fantasy this is well up there, along with the mistborn series, again another work of magic. Not having the time the read this book (or perhaps the strength to lift it) I chose to listen to it. I confess that I got 2-3 hours in an realised my mind had wondered so much that I had no idea what was going on. That is not good. However, on a second attempt I got up to speed and really enjoyed it. At first I was a little miffed that the readers are American. I generally don't like that. Reading isn't my preferred reader by any means. Kramer and Reading read all the Wheel of Time books on audio and I wasn't that attracted to her then - I have only listened to the first one. Her intonation is quite annoying at times. Perhaps not to the north american ear but it is to mine. I get through 3-4 audio books a month so I've listened to a few now. Otherwise, it's a great book and worthy of the David Gemmell Legend Award for fantasy. It's high fantasy with a broad sweep and a different feel with Shardblades, light-eyes, great use of the stormlight in allowing wielders of it to 'lash' themselves to walls and ceilings such that 'up' becomes 'down' and so on. Great world building and vision with some truly memorable characters. High fantasy at its best. If it wasn't for Reading, I would have given it a 5. Long - 45 hours and the first of 10 books! Epic certainly sums up this work. 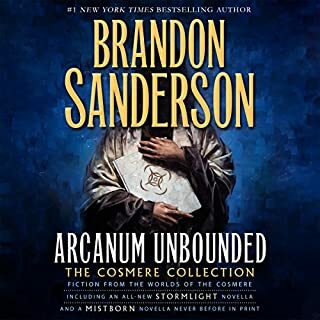 After almost reaching the end of this 45 hour book, I did some quick searching on the net and found Brandon Sanderson is planning this is a 10 book series! If you're after a fast-paced story, this probably isn't for you. If you loved the Wheel of Time series you'll probably love it. (Personally, I gave up after about 7 books....). The character development in this story is excellent as you'd expect and I certainly enjoyed the book. However, given its length and lack of excitement in many places I'm not sure I'll be back for book Two onward. slow beginning, lots of world building but the payoff is huge, great 1st book and it really launched the next book, which is an absolute must read/listen too! the Sanderson/Kramer/Reading combo is dynamite. I loved this sooooo much, characters are well developed, are all different enough to add to an exciting read and despite it's very long read/listen, it's worth every second. Brandon Sanderson has quickly become one of my faves. amazing fantasy story that covers a few people's journeys through an interesting new world! loved it! When I first started listening to this I didn't realise it was the beginning of a 10 part series. It felt slow and there is a lot of history in the book so it jumps back and forth through time.I started to tire of leaning about of the people, locations and strange landscapes and artefacts of this world. I just wanted to get into the story. But once I realised how many more books where to come I felt like it was quite justified. The story is set in a world with weird creatures and landscapes and it does need a bit more time to set the scene then many other fantasies I've read. In the beginning I also found some of the characters frustrating and a boring because they seems a bit 2D or simple. I really wasn't sure how much I was going to enjoy this book but then suddenly everything picked up! Things happened, characters developed and now I am hooked. There where a few nights I stayed up way to late because I just had to know what happened next. Compared to other audio books I've listened to I found the narrators rather flat and this was very disappointing. I was also a bit confused at one point because they pronounced one of the characters names differently and it took me a moment to realise. Long book with huge scope. That final act is fantastic. Thank God I'm not a bridgeman. 5 stars all round. Excellent book. Expertly read. if you like fantasy in the slightest, stop reading this and buy the damn book! honestly the best book ive ever read. in every aspect this book leaves me speechless.